Is it conceivable that Premier Jean Charest will announce in mid-August that he will send Quebecers to the polls on Monday, September 17? That is what influential Quebecor Media columnist Michel Hébert suggested over the weekend. The dilemma for Charest is that September 17 marks the first day of Rosh Hashanah, the Jewish New Year. According to Hébert, Liberal strategists do not wish for Charest to go a week later (September 24). While Rosh Hashanah does not impact upon the entire province, one man who would certainly be very inconvenienced by this is the de facto Quebec Minister of Jewish Affairs Lawrence Bergman. The veteran D'Arcy McGee MNA and chair of the government caucus is the former president of the Adath Israel Congregation. He could hardly be expected to campaign on such a day. And what kind of team could he muster up? "Driving" is not acceptable on a Jewish High Holy Day. Would Bergman be expected to run his entire campaign during the advance polls? The riding of Outremont, held by Finance and Revenue Minister Raymond Bachand, has the verty influential Hassidic Jewish vote. Mount Royal, Westmount-Ville Marie, St. Laurent and West Island Robert Baldwin also have a number of Jewish voters. Monday, September 24 is just two days before Yom Kippur, the Holiest day of the year on the Jewish calendar. The Young Quebec Liberals will convene in Victoriaville on August 10. 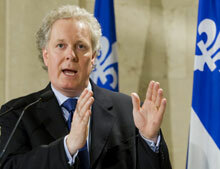 It is soon after that Charest is expected to call an election while he still has a chance to win. Can you try for Monday, September 10 Jean? The Suburban 2011. Powered by Blogger.